These controls require a clean, dry source of compressed air, 20 psi being typically used. Since pneumatic controls are air consuming devices, compressor sizing should include the terminal controls. Control devices may include a velocity controller, air velocity sensor, pneumatic actuator, and volume damper. The pneumatic velocity controller is the brain which monitors pneumatic input signals from the thermostat and velocity sensor, and outputs a signal to the damper actuator resulting in air flow regulation. The pneumatic velocity sensor is mounted in the inlet of the terminal in the air stream, and provides the velocity controller with a signal proportional to actual air velocity pressure. The pneumatic damper actuator receives a pressure signal from the velocity controller in response to actual flow vs. desired flow. 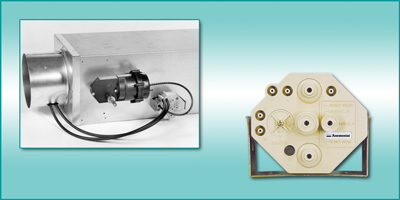 The pneumatic velocity controller is a "pneumatic computer", monitoring inputs and directing outputs to maintain space temperature by controlling the flow rate of conditioned air into the space. The controller receives a pressure (psi) input signal from the thermostat (for variable air volume control), indicative of what air flow rate the thermostat requires to meet or maintain room temperature set point. As this input pressure varies, the controller is reset to a new required flow rate. The reset span or reset range is the input pressure range over which flow can be varied. The reset start point is the pressure at which reset begins. The flow rates at the beginning and end of the reset span are the upper and lower limits of air flow, commonly called maximum and minimum set points. Velocity controllers have dials which allow for adjustment of both the maximum and minimum flow rates. Anemostat pre-calibrates all controllers to their specified maximum and minimum flow rates, but remain adjustable in the field for flow trimming. The velocity controller constantly monitors two input pressure signals (inches w.c.) from the pneumatic air velocity sensor, located in the supply air stream. These signals are proportional to total pressure (high) and duct static pressure (low). The velocity controller automatically calculates velocity pressure through subtraction of total pressure minus static pressure (High-Low=ƒ¢P). This differential signal then represents the controlled variable, air velocity pressure. By comparison of desired flow and actual flow, the controller responds with an output pressure (psi) to the pneumatic damper actuator for volume damper positioning. The main air source is used by the controller for this output pressure. Any flow rate change, due to duct static pressure changes or damper positioning changes, are automatically interpreted by the controller.